• Participation in Asian School Championship from 12th to 19th Aug 2016 held at Singapore. • Participated In Asia Junior Sports Exchange Games 2015 (Tokyo-Japan) in August 2015. • Gold medal in CBSE National Table Tennis Championship held at Vadodara from 24th to 28th November 2016. • Silver Medal in School National Games held at New Delhi from 2nd to 9th jan 2017. • Silver Medal in Sub-Junior Girls Doubles in 77th Cadet & Sub-Junior Nationals T.T Championship held at Kolkata (W.B) 2015. • Bronze Medal in Sub-Junior Girls Teams in 77th Cadet & Sub-Junior Nationals T.T Championship held at Kolkata (W.B) 2015. • Gold Medal in Cadet 14 Team in C.B.S.E. held at The Emerald Heights International School Indore from 8th to 12th December, 2014. • Gold Medal in Cadet 14 Team in Indian Public School Conference held at Welhams Girl School Dehradun from 27th to 29th September 2014. • Silver Medal in Doubles in U-19 in Inter DPS National Multi Sports Meet Girls held at DPS Greater Noida from 27th to 29th November, 2015. • Gold Medal in Individuals in U-19 in Inter DPS National Multi Sports Meet Girls held at DPS Greater Noida from 27th To 29th November, 2015. • Gold Medal in Cadet 14 Team in 60th National School Games 2014-2015 held at Tadepalligudem Andhra Pradesh from 2nd to 6th October, 2014. • Silver Medal in Cadet 14 Team in 59th National School Games 2014-2015 held at Aurangabad, Maharashtra from 1st to 5th January, 2014. • Gold Medal in Cadet 14 Team in C.B.S.E Held At Dav School Durgapur from 25th to 29th November, 2013. 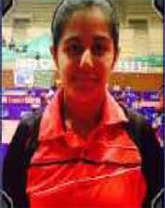 • Bronze Medal in Cadet Girls Team in 7th Cadet Inter State Championship held at Gandhi Nagar from 16th to 21th January, 2013. • Bronze Medal in Cadet Girls in New India Assurance, 73rd Cadets & Sub Junior National And Inter State T.T Championship held at Rajiv Ganghi Indoor Stadium, Cochin from 8th to 13th December, 2011.